Robert Reid of AP reports that the Iraqi government is acknowledging differences with the US over the proposed security agreement intended to regulate the role of US troops in Iraq. The USG Open Source Center translates remarks last Friday of Jalal al-Din al-Saghir of the Buratha Mosque in north Baghdad. 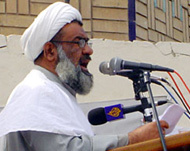 Saghir is a leading member of the Islamic Supreme Council of Iraq, the most influential party in the government of Prime Minister Nur al-Maliki and leader of the Shiite coalition, the United Iraqi Alliance. Saghir’s views are likely close to party leader Abdul Aziz al-Hakim, the power behind the al-Maliki throne. That is, Saghir is no Muqtada al-Sadr but rather a pillar of the Shiite-American alliance in Iraq. I view Saghir’s criticisms of the proposed security agreement between Bush and al-Maliki as a sign that the negotiations are in real trouble. Saturday, May 31, 2008 . . .
Baghdad Al-Iraqiyah Television in Arabic – government-sponsored television station, run by the Iraqi Media Network – at 0914 GMT is observed to carry live the following Friday sermon from the Buratha Mosque in Baghdad. Shaykh Jalal-al-Din al-Saghir delivers the sermon . . .